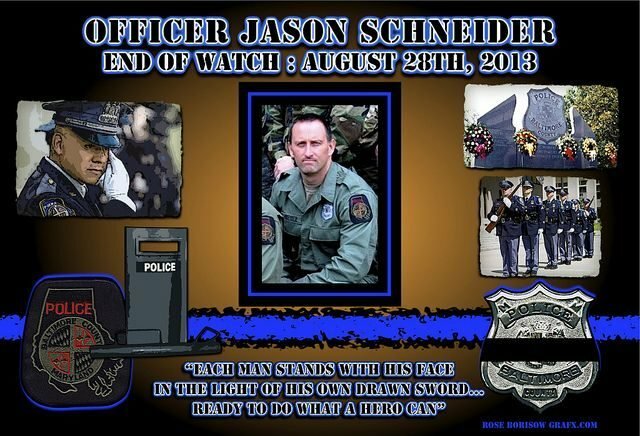 Chief James W. Johnson of the Baltimore County Police Department has reported that Tactical Officer Jason Schneider, 36, was fatally shot while serving a search warrant. Chief Johnson stated that there had been a decline in violent crime over the past 5 years. However, he also noted that there had been 4 four shootings in the Catonsville area in the past month. The County Police Tactical Unit was serving a warrant related to one of those shootings. The Tactical Unit had announced their presence as they entered a home on Winters Lane at 5:30 am. Several persons within the residence commenced to flee upon the officers’arrival. Schneider and other tactical officers were going room to room searching for the suspect when Schneider was shot several times. Schneider returned fire, hitting the suspect. Officer Schneider was transported to University of Maryland Shock Trauma Center where he was pronounced dead. The suspect, who was not identified, remains in critical condition at the same hospital suffering from multiple gunshot wounds.